Children are sacred in Senegal. They are considered gifts, since they will become the future generation and therefore enrich society and the economy. 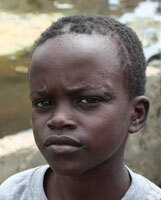 However, there is a severe lack of protection and aid for Senegalese children. 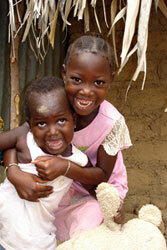 Violence and poverty in Senegal prevent them from having the usual carefree childhood. More than half of the population live below the poverty line in Senegal but children are much more vulnerable in this state than adults. Their rights are disregarded and they face problems like hunger, access to drinking water and even being forced to work. According to a study carried out between 2005 and 2009, an estimated 19% of newborns are born underweight. 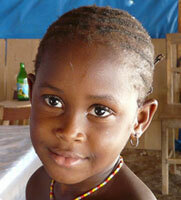 Although recent efforts have been made in Senegal, children’s health remains a serious problem. Polio continues to be a concern due to the lack of vaccinations. Malaria is also still widespread and is becoming more and more serious. This disease is the cause of close to 30% of children’s deaths in the country and it also leads to anemia and miscarriages for pregnant women. Children also suffer from diarrhea and iodine deficiency. More than 80% are anemic. The infant mortality rate is extremely high. 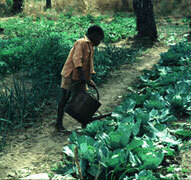 Additionally, malnutrition is a daily fact of life for most Senegalese children. Almost 40% of Senegalese children do not go to school. Sexual discrimination begins at an early age for children in Senegal and endures for their whole lives. Only one out of five young girls attend high school and as adults, only 6 women are literate for every 10 men. Typically, in the Senegalese countryside, young boys are put into “daaras”, which are Koranic schools. These children, who are then called “talibés”, are entrusted to marabouts, who carry out their religious instruction. Unfortunately, these schools are not subject to any legal regulations, so they tend to attract immoral people, even though some are respectful of the children. Some marabouts force children to beg all day and then they collect what they bring back. In addition, daaras are often dirty places where hygiene and personal care are quite lax. In some daaras, the children are beaten. Parents who cannot afford to send their children to school often turn to these marabouts, who usually take advantage and exploit their children in appalling conditions. In Senegal, almost a quarter of children between the ages of 5 and 14 are forced to work to supplement their family’s income. Young Senegalese children are forced to give up school even before their tenth year. They take work as domestic help, in miserable working conditions for a very small salary. Some young women are victims of sexual harassment and violence. This abuse often remains hidden and protective services are virtually non-existent for them. As for the men, many cotton plantation managers or other agricultural managers employ them in very hard labor. The young talibés are often forced to beg in dreadful conditions, some are beaten if they do not meet a certain quota. Other marabouts create strict schedules for the children, who sometimes have to beg up to 9 hours per day. Between 2000 and 2009, almost 40% of young Senegalese girls who were questioned admitted to being married before the age of 18. This practice is proven to carry with it severe emotional and psychosocial consequences for the young women. They enter into sexual relationships which are not always consensual and they must pass from childhood to adulthood without going through adolescence. These marriages are even more harmful to young women since very often they have no say about whom is chosen to be their future husband. Although Senegalese law prohibits forced marriage and enforces penalties relative to the girl’s age, these unions are still quite common in this country. Senegal is not exempt from the large network of child trafficking that affects the entire African continent. This country is the arrival point for many children in neighboring countries, like Guinea-Bissau. Those who arrive here are often employed and exploited in the cotton fields. Some marabouts and daaras participate in child trafficking. When the children are not sent to beg, they are sometimes sent to the cotton fields, where the conditions are even crueler. Senegal predicts that the practice of female genital mutilation will be completely eradicated by the year 2015. To be sure, real efforts are being made to this effect, however, this practice is still a reality. The dangerous and unhygienic methods used (no trained medical professionals and no anesthesia), have detrimental consequences on the psychological and physical health of the girls. Additionally, studies have proved that genital mutilation in mothers has a negative effect on newborns, who encounter a much higher risk of dying in childbirth. Almost half of all births are not officially recorded in Senegal. Registering births and granting citizenship gives them legal rights. Children whose identities are not registered cannot be officially recognized by the state and they cannot realize their rights. They are invisible in the eyes of society.